I tried to keep that thought in my mind on Saturday as I ran the Pepsi 10K. I wanted to finish the race without any regrets, but when I saw the clock hit 45:00 within spitting distance of the finish line, the expletives started flying. Even though I knew I'd still earn a new 10K PR, it wasn't quite good enough because I didn't break 45 (which is really stupid because I hadn't even thought running 44:59 was a realistic goal that morning). So I wonder, if I had the energy to sware like I were on an episode of the Real Housewives, maybe I didn't leave everything on the course. Maybe I could have run two seconds faster?! Yet, if I had, wouldn't I have just found another reason to question my performance? Somehow, my best is never quite good enough. Ugh! Is that what most athletes struggle with or is it just me?! After the MP3 fail at the Women's Four Miler two weeks ago (my SanDisk clip died 1/2 mile into the race, the horror! ), I decided to run with my iPhone for this race. I had my speaker on full volume so others running a 7:15 pace could enjoy some tunes as well. I love using shuffle because you never know if the right song will pop up when you need it. Somehow iTunes was in sync with my brain. Around mile 4, when I was trying to pass a couple healthy looking college-aged guys, "Sure Shot" started blaring. 'Cause you can't, you won't and you don't stop... 'Cause you can't, you won't and you don't stop" ... I didn't stop! I ran right past them and kept going strong! Mile 5: Pitbull sang, "Give me everything tonight, For all we know we might not get tomorrow." I thought about the pain of regret, and maybe this will be the last chance I'll run this race since I'll be moving to Wichita next summer, and I pushed through some unpleasantness up a hill. So here are the stats. I ran 10 seconds faster overall than last year. My first mile was 6 seconds slower than the previous year, but still was probably 10-12 seconds too fast. I definitely slowed in the 2nd half of the race as I did before, but it was less significant this year. I also was able to sprint a little faster the final .2 mile. 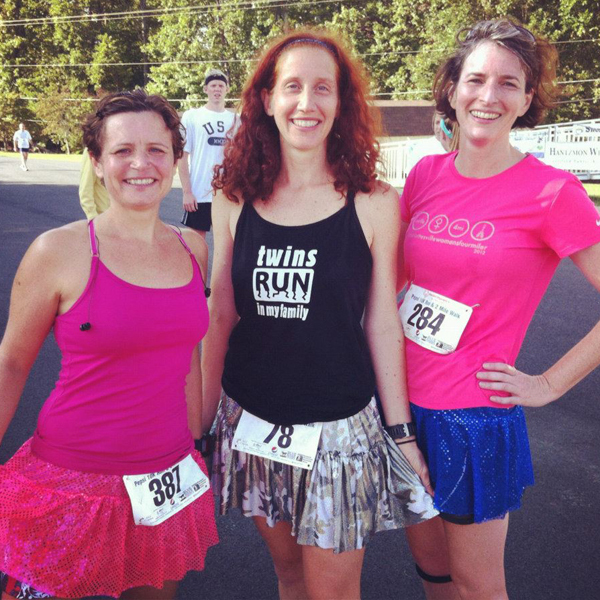 Once again, the best part about racing in Charlottesville is seeing all my friends along the course and after the race. I've already converted two of them into Team Sparkle gals! I think it's a great time personally. I've been running just over a year and I still am not quite that fast. I hope to get to those kind of numbers within another year or so. Also Leah, I wanted your advice. I'll be doing my first half-marathon at the C'ville classic in late October. Then I'd like to start training for a full marathon. I was wondering if you had any ideas for local-area races starting no earlier than February? Probably March would give me a little more cushion. I don't want later than May due to heat! Thanks.